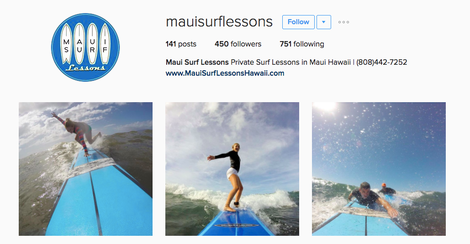 Wondering what to put in your Instagram Bio? Instagram Bios may seem like a small and trivial part of the Instagram set up, but those little blurbs of information are SO IMPORTANT. We’re going to give you a crash course on the principles of the best bios for Instagram, along with examples to see these principles in action. If you read this guide completely, I personally guarantee you’ll never wonder what to put in your bio again. Many people just take a photo from another one of their social media accounts and post it as their Instagram Profile Photo. First off, the photo has to be good quality and engage people’s attention. That seems simple enough. But, not every Instagram account denotes a generic headshot photo. 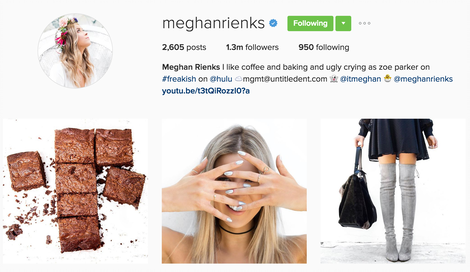 For example, fashion and lifestyle bloggers, such as Meghan Rienks, should always post a headshot photo of themselves. Wonder why? Because their Instagram Accounts should be all about them. 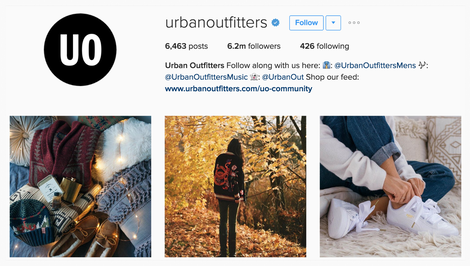 Their Instagram feed is all about their fashion and how they live #luxuriously, so their profile photo should be a reflection of that. It should draw followers into their life. Now for brands and businesses, choosing the right profile pic can be a little bit different. Many companies choose to forgo the typical headshot photo because the Instagram Account isn’t about them, but their business. Posting your company’s Logo instead of a headshot is the right way to go. It might be safe, but it’s effective. Logos are representations of the brands and businesses themselves. People may see the logo and ask themselves, I wonder company that is? They visit your account to inquire more and the next thing you know, they end up following you. 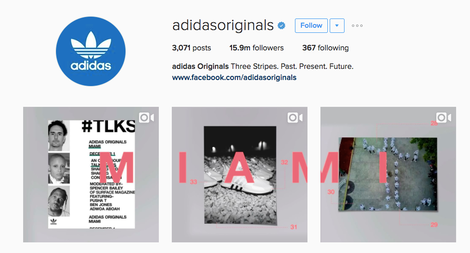 With the introduction of Stories, profile pictures are more important than ever. For more tips on how to paint yourself in the best light, check out this awesome article on Instagram Profile Picture Tips, Best Practices, Hacks and More! Picking a username for Instagram seems like a big deal and that’s because it is. The Username you decide on should embody whatever it is your Instagram Account is about. It should in some way represent your brand, business, company, or website. Choose a name that is short, simple, or maybe easy to remember. Followers are more likely to check back on your feed or revisit your account if they can easily remember your Username. 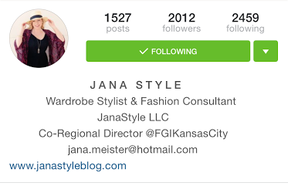 If you are a fashion or beauty blogger, we suggest setting your actual name as your Instagram Username. It allows your followers to feel like they know you as a person and establishes the account as all about you and your beauty/fashion tips. If you are a start-up company or business, then we highly recommend using your company’s name as your Username. Having your company’s name attached to cool and interesting content that people will follow or tell their friends about is great exposure for up and coming businesses. If your company name is already taken, then you’re probably sh*t out of luck. Just kidding! You’ll just have to get creative. You could add “official” to your name ala @chanelofficial. You could add underscores between words, like @frank_bod (periods also work). Or you could add a city name or city abbreviation like @chefpepecarmel and @nopalitosf. 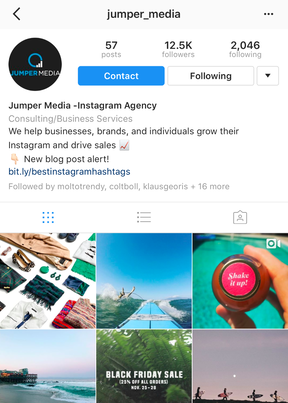 If you know of any other ways to get creative when your desired username is already taken, hit us up on Instagram @jumper_media and let us know! If you have a Blog or a Company Website, why not include it in your bio? 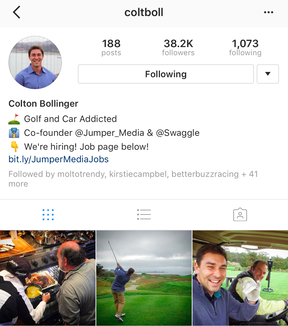 Including links in your Instagram Bio not only lets people know you’re a real person or company but also helps drive engagement between you and your followers. For businesses especially, it can establish a one-on-one repertoire with potential clients. Urban Outfitters seems to have the right idea! or, WHAT DO I PUT IN MY INSTAGRAM BIO? Emojis are eye-catchers! They catch the reader’s attention and draw them in. Don’t be afraid to use them. They can operate as silly little punchlines or even serve as substitutes for words. Most importantly, Emojis add personality to Instagram Bios. 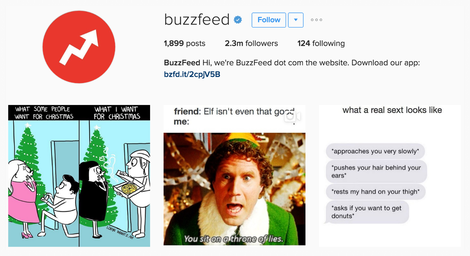 They show your followers you have a funny side — funny Instagram bio alert! Try to remember that the way you get followers is that people have to like you. In order to increase followers, people have to take an interest in what you say and do. For some people, this might mean increasing videos or live photos, but truthfully, everyone’s tactics for appealing to people is different because every Instagrammer is different. No one shares the same life story. Don’t be afraid to tell your followers a little bit about yourself. So be sure to tell your story, but keep it simple and try to make people feel something that will make them say, “Hey, this person’s pretty cool…”. Here’s an idea: try not to be too serious when writing your bio. Sure, a serious mellow tone is good once in a while, but nobody wants to follow somebody who is morose twenty-four-seven. Spice your bio up with comedy and humor. Embrace your inner comedian. Let your humor and wit shine. In most cases, followers will be drawn into your content if your Bio has some humor to it (check out what we did with Allie the dog’s Insta bio here). Ten out of ten would agree…funny Instagram bios are the best! The trick to keeping your Instagram Bio short and simple is to use keywords that immediately catch someone’s attention. Some people have short attention spans and others just don’t want to read a long story about your life, achievements, goals, and interests. Using keywords is a great tactic to not only keep your bio short and to the point, but also highlights the most important stuff about you or your business. Not only that, but potential followers who skim through bios are most likely looking for some keyword or indicator that you like the same things they do or have similar goals/interests/hobbies. Sure it may look kind of like a grocery list, but that’s also a good thing. A vertical format highlights the important stuff of your bio.The generic standard is to list what you do for a living and where you’re from. But, there is no quota on what you can’t include. 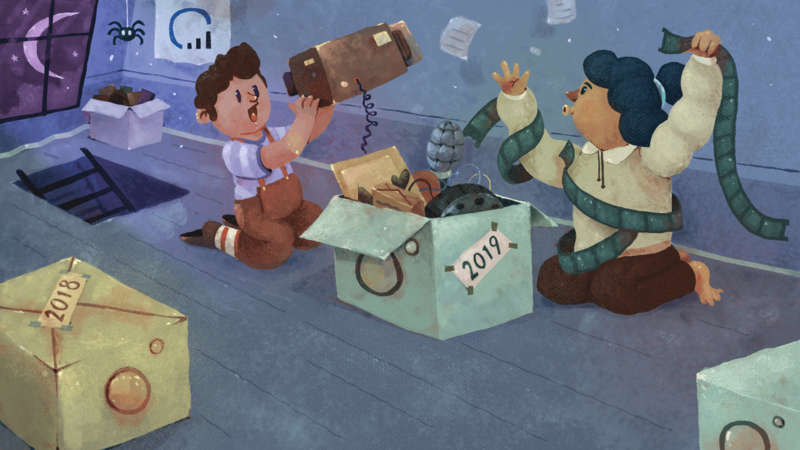 People often include funny talents of theirs or list their favorite hobbies and pastimes.The possibilities of what to include are endless and fun to experiment with. Some Instagrammers center text for their Bios. This formatting is an interesting and different approach to most bios; nonetheless, it is another great strategy to utilize. The center format places the writing front and center and immediately catches a person’s attention. This format is also great for including quotes of the day or small inspiring poems. The center format is great for any artsy and creative person. 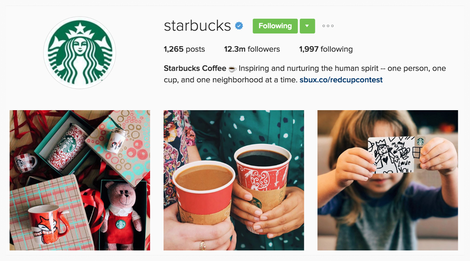 Everybody knows about Starbucks, so their Bio doesn’t technically even need to be that thrilling. However, this company does not slack when it comes to its social media presence. Their Instagram Bio is short, snappy, includes humor and a cute little quote, and just gives off an impression of a warm and welcoming feeling. They even include a link to their Red Cup Contest. And of course, their bio wouldn’t be complete without the coffee cup emoji! 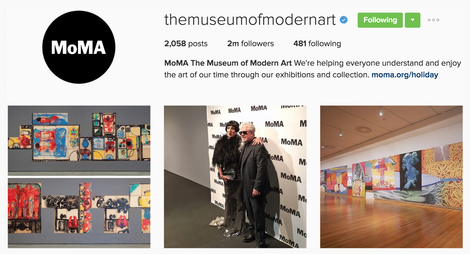 The Museum of Modern Art’s Biography may not have that #cutsie element to it, but it doesn’t need to. MoMa’s Bio gets right down to the point. They explain their purpose and their call to action in just one sentence. Also, it is perfectly concise. Plus, no one can deny their huge following. 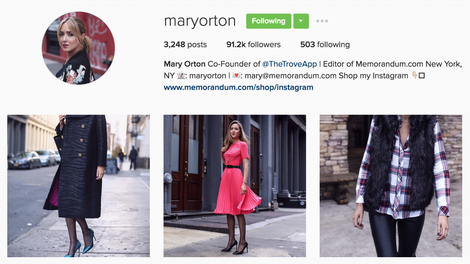 This fashion blogger definitely knows how to write a #amazing Bio! She utilizes emojis throughout her bio, lists her business accomplishments, and includes the links to her second Instagram account, email, Snapchat username, and URL for shopping her Instagram fashion. I guess our bio is ok.
At least we keep it bio short, simple. No time for nonsense! We lay out our call to action and of course, add a little silliness with some emojis. Plus, we always alert our followers to new blog posts.And we make sure to include a link to all of our newest blog posts! 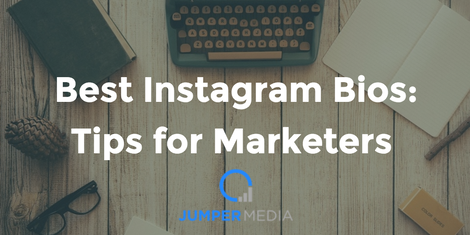 We’ve given you an outline of steps to take, offered some helpful tips to keep in mind, and listed some successful Instagram Bios from the pros. Now it is time for you to take the next step! Start experimenting! Like many good authors would say, “write what you know”. Start from there and see where that takes you. What does your Instagram bio say? Let us know in the comments!